The first of four bodies is removed from the basement of a residence on the 5100 block of Malcolm Street on Monday. Nadirrah Smith said a close friend phoned her about 7:30 p.m. Sunday, and before he hung up he said he'd call her back. He never did. 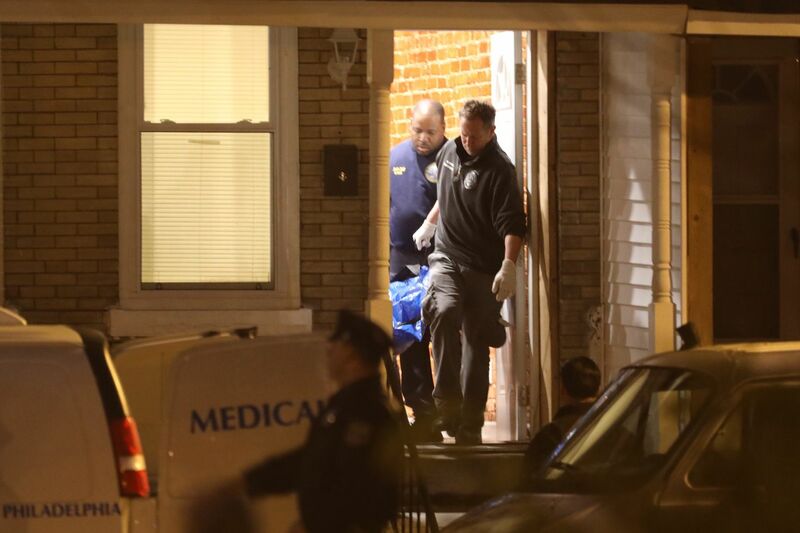 A distraught Smith said Monday that the man was one of four people found fatally shot, execution-style, in the basement of a home under renovation in the Cedar Park section of West Philadelphia. Two women and two men, whose identities police would not confirm, were found in the home in the 5100 block of Malcolm Street with gunshot wounds to the head, police said. Medics pronounced them dead at 12:21 p.m. It was the largest number of victims in a Philadelphia homicide this year. "Sadly, all four of these individuals were executed — there's no ifs, ands, or buts about it," Police Commissioner Richard Ross said. "This is an absolutely evil thing to do. … There is no way in the world people should have met their demise this way." Smith, 25, said she believed her friend's brother was also one of the victims, but said she did not know his name or who the women in the basement might have been. Smith said her friend "was a good dude." Crying as she stood next to crime scene tape, she said the man had two daughters and had recently moved into the house. As a result, she said, not many people knew where he lived, and she therefore believed that "this had to be a setup." The deaths pushed the city over 300 homicide victims for the year — more than the year-end totals in 2016, 2015, 2014, and 2013, according to police statistics. Ross, speaking at the scene, said the ongoing violence left him "disturbed, annoyed, angry," and demonstrated the need to take a broader approach to combating crime, considering factors such as poverty in conjunction with crime-fighting tactics. Earlier this fall, Mayor Kenney declared the city's level of gun violence a public health crisis, and asked his cabinet to deliver him a strategic plan within 100 days. "That's what troubles me as much as anything else, that in the United States of America, this type of gun violence persists," Ross said. "I just have to believe we have the wherewithal and the resources to do more than we're doing." Philadelphia Police Commissioner Richard Ross outside a rowhouse on the 5100 block of Malcolm Street in West Philadelphia, where four people were found shot to death Monday, Nov. 19, 2018. Ross said police received a call Monday morning to check on the welfare of people at the house on Malcolm Street. Responding officers found the bodies in the unfinished basement, he said. Police were not sure how long the bodies had been there, but Ross said a neighbor had reported hearing a couple of "bangs" around 10 or 11 p.m. Sunday. At the time, the neighbor assumed the bangs were related to the upstairs renovation, the commissioner said. Ross said police believe that the victims — the two men may have been cousins, he said — were led into the basement, because their hands and feet were not bound or tied. He added that there were no obvious signs of a struggle inside the home. Nadirrah Smith reacts to the news of Philadelphia police investigating four bodies found shot in the basement of a residence on the 5100 block of Malcolm Street on Monday, Nov. 19, 2018. Ross said investigators were still seeking witnesses and possible surveillance video to figure out what happened. Police were not immediately certain how many weapons were used in the slayings. Ross said he didn't know who owns the house or whether the owner had any connection to the victims. Property records show that the home was bought for $3 by an Alice Jones on Aug. 19, 2009. Attempts to reach her were unsuccessful. Outside the house Monday, onlookers watched as detectives collected evidence on the block, which was cordoned off by police and filled with more than a dozen officers and commanders. One of the onlookers, Lucille Walker, who said she had lived in the area for at least 30 years, described the event as "shocking." "I'm a little perturbed," she said. "It's an atrocity." Another, Beth Harrell, an emergency room worker at the Hospital of the University of Pennsylvania, said she was frightened by the violence on a block that her mother can see from her home on nearby Baltimore Avenue. "When something like this happens at your doorstep," she said, "it's scary."